If you like to use extensions on your hair, there are some ways to do so. One way is to the new hair sewn in, but the procedure is painful. The another option is to use glue to the place, again removing the glue is a difficult task from the hair. Hair extension will make the hair long and beautiful and attractive, but removing from the scalp is a big question, and the answer is no. Keeping glue on the hair for a long time may cause damage. The best way to keep the scalp or hair intact is to remove lies from the hair with essential oils. When you finish reading this article, you will able to know the right way to remove hair glue from the hair. Some oils like almond oil, baby oil, olive oil, avocado oil will be the best starting point to eliminate the hair glue from hair. Moist your hair with oil and then wrap it in a towel or shower cap. Keep it from 15 to 20 minutes to ensure it deactivates the elements of the adhesive as much as it can. Combine off the glue and try softly peeling, that has just loosened with the oil. As this will take time so be patient. Be sure you would not like to damage your hair. Dish soap is another kind of oil alternative, and help much to remove oil later on. It contributes to loosening the glue, makes it easier and softer to manipulate. After that Rub, some dish soap over your scalp with lukewarm water and make sure you rub all the glue spot from your head. 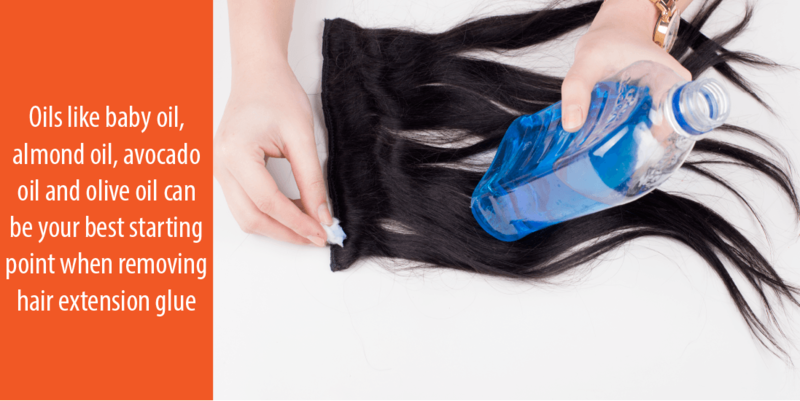 Leave the dish soap for an hour and wrap hair with a towel as you are waiting. Wash the shampoo well, and glue will peel off easily and comb without pulling the hair. Acetone or alcohol may break the glue bonding of your tresses to the desired level, but you have to make some little efforts. 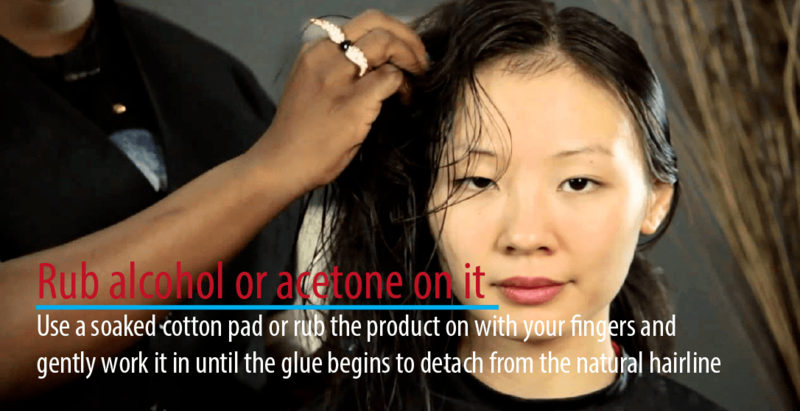 You should not douse your hair with acetone or alcohol, rather it will dry the hair and scalp, you need to use it on the area where there is the glue. Take a soaked cotton pad, then rub the product with the help of your fingers and softly work as long as the glue begins to detach off the natural hairline. You may believe it or but, but the reality is conditioner is a great product for the hair. To remove glue bond, you can do it with the weight hair. Wash the hair for the first time, then use the generous amount of conditioner on your hair and wait under a towel for twenty minutes. 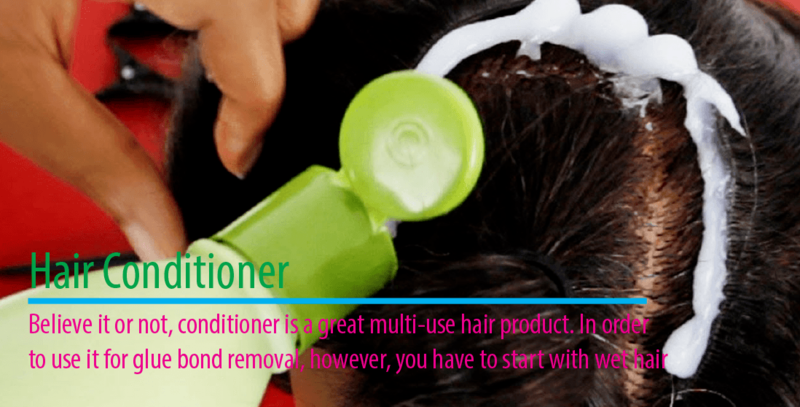 You normally remove the conditioner out and comb the rest of glue out of the hair. For the first time, if it does not come out, do the same thing again and the whole process as many times you need. If you like to remove the glue bond by using removal cream, then you can use peanut butter, this is a great substance. Like the other three methods, you may use the peanut butter to the glue adherents and the wait for fifteen to thirty minutes. Within the time the glue bond will loosen and permit you to pull off without much effort. The most important thing is to give much time to peanut butter to do its function. As you have seen the glue comes with some advantages, this has many precautions that you need to follow strictly. There are several techniques to remove the glue bond from hair. The Avalon Beauty School of Cosmetology told your hair is their most important thing. Contact with them to know more about the hair extension and or some other affordable services. Ensure a clean wash off your hair with clarifying shampoo by using the lightweight conditioner. Set cold air setting with your blow dryer with using comb extension. Do the work with the comb extension to eliminate stray pieces of more glue. Let not try warm air as it may remelt the glue. As you have pinch, you should better to use peanut butter instead of oil. You should have to sit for a long time about thirty minutes or more – the natural oil or peanut butter will serve the same purpose of almond, baby oil or olive oil, the may break down your extensions’ glue. As you like to remove the hair extension by the stylist, you should better not to attempt at your home. When you complete the process, you will see that the hair is the bit greasier than the previous state and begins removing the glue from the scalp. This is very normal and saves the hair from further decay. Wait for one day before washing your hair again, if you like to grow the hair longer, it back out. At the time of final wash be sure, you have to use a shampoo that supports damaged or beautiful hair. Then use a product that will ensure the body of your hair. This is the way by which you will be sure that there is no sign of removing hair extensions. As the hair or scalp is free from glue, make them clean or fresh and remove all oil from the hair. You may use No Sweat antiperspirant with spraying one time with cloth or paper towel and shipping on the whole area. Sweat would not dry rapidly, allowing the glue to take for one minute and applying no Sweat. There is no particular way of using hair glue remover from the air or alcohol based, each of the hair glue removers comes with some types of instructions. So it is important to follow the instruction or guidelines well. The instructions are necessary to follow. You can come to the conclusion of your damaged skin or hair unit or both if you use it accurately. If you do not follow the instruction, it will be the cause of losing money at the same time damage to hair. Glue makes an enormous mess once it contacts baldness. Children, people with long hair and pets can readily get adhesive in their hair while focusing on craft projects. It’s necessary to swiftly eliminate the paste before children start cutting away in their hair, or until pets begin licking at their coat. If you have gotten adhesive in the rear part of your hair, you might wish someone to help you get out it. Clip back all the hair round the paste to stop spreading the dough. The rubbing alcohol can help deactivate the paste’s adhesive properties. Gently comb the hair out and dip the comb to the mix after every stroke. If you do not have some rubbing alcohol, then you might even split two crushed-up aspirins in plain water. Wash the comb off using a moist towel when it becomes coated with adhesive. Pull away all of the hair. Soak a cotton ball nail polish remover and set it in addition to the dried paste. If you’re concerned about the fumes or becoming adhesive off a kid’s mind, you may use this with witch hazel. Pull the hair with your fingers, so it is no more sticking together. Whenever you’ve freed up from their hair to comb, wet the whole region to get rid of the nail polish remover. Keep combing the hair before nearly all paste is gone. Dry the area with a hair drier to be sure all the glue was eliminated; sometimes it’s tough to tell when working with wet hair. Condition the shampoo and hair. Condition the nose, then dry. Separate the pet in 1 area by shutting the door. Have someone help you maintain the pet. Based on the degree of their pet’s excitability, you might choose to wrap your pet in a towel to protect against getting clawed. Dip a spoonful in vegetable oil and brush the spoon during the glue-covered fur. Be sure that you receive all the glue. Then shampoo the localized region or the whole fur. Dry the pet using a towel and confirm the place for almost any remaining adhesive.